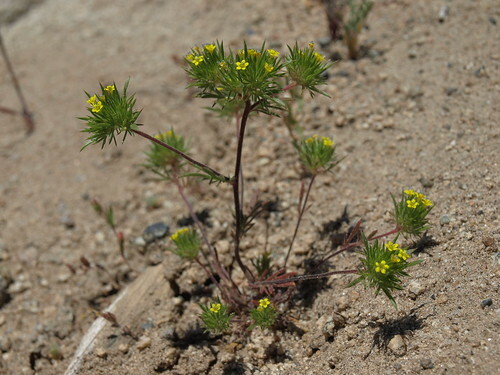 yellow pincushion plant, Navarretia breweri, California, Glass Mountain, Benton Crossing Road, Owens Valley drainage, elevation 2228 m (7310 ft). One of my favorite annual "belly plants" to stumble across, being unusual in its genus (and in the phlox family) for the tiny bright yellow flowers. The species is widespread in the mountains and steppes of the interior western United States, from the Columbia Plateau south through the Great Basin and Colorado Plateau, to the higher mountains of the Mojave Desert -- and the mountains immediately adjacent to these regions. It has a preference for open, seasonally moist places like dry meadows, drainage bottoms, and snowdrift areas, and has been found up to about 3300 meters (11000 feet) elevation.